What if I tell you that your website will load faster using fewer resources and at the same expenses? It would be a WOW for you. Isn't it? Just a few decades back, the web was not as accessible and reliable as it is today. Agree? But as with the growing advancements and demands in the IT industry, the scenario has taken a different turn and things have become easier for us. And when we talk about issues in websites, developers have worked hard to overcome the current issues including speed, performance, and a lot more with the recent update of HTTP/2. You might be knowing about HTTP/2. Isn't it? If not, let us explore more about HTTP/2 and how it has transformed the websites. HTTP/2 is the most recent update made to HTTP by IETF(Internet Engineering Task Force). This update was a much-needed update to the existing HTTP/1.1 protocol in order to address the existing issues in websites. HTTP/2 brings a straightforward improvement in website speed, efficiency, performance, security, and usability aspects. Want to know the major improvements which HTTP/2 brought to the web industry? Here is a list of major improvements in HTTP/2. Faster loading of website pages: Implementing HTTP/2 enhances your browsing experience while making the website pages load faster than being done in the older version of HTTP/1.1. Mobile friendly: As the header compression is more enhanced, HTTP/2 assists mobile sites with a high volume of requests to avoid downloading wasted bandwidth from headers. Enhanced security: The best part of HTTP/2 is that it has got encryption by default in its architecture. This provides you with more security and an assurity of the website data being safe. Compatibility: The browsers which are still running on HTTP/1.1, there is nothing to be worried about. They can still communicate with the HTTP/2-powered browsers. Multiplexing: In HTTP/1.1, every single transfer had to wait while the previous transfer completes and then it is carried out. While HTTP/2 allows multiple requests to be carried out at the same time and on the same connection. Binary: HTTP/2 makes the server more compact, easy to parse, and less error-prone. Moreover, time can be saved which is spent while translating from text to binary. Single connection: A single connection to the server helps in loading the website, and the connection remains open till the website is open. Thereby, reducing the number of round trips required to set multiple TCP connections. Server push: You can easily send additional resources to a customer for future use. Header compression: Unlike HTTP/1.1, where multiple headers were sent with the same values in every request, HTTP/2 lets you stay away from this hassle. As HTTP/2 uses HPACK compressions, this helps in reducing overhead. Prioritization: All the requests are assigned in such a way that the server can deliver the higher priority resources faster than the other ones. 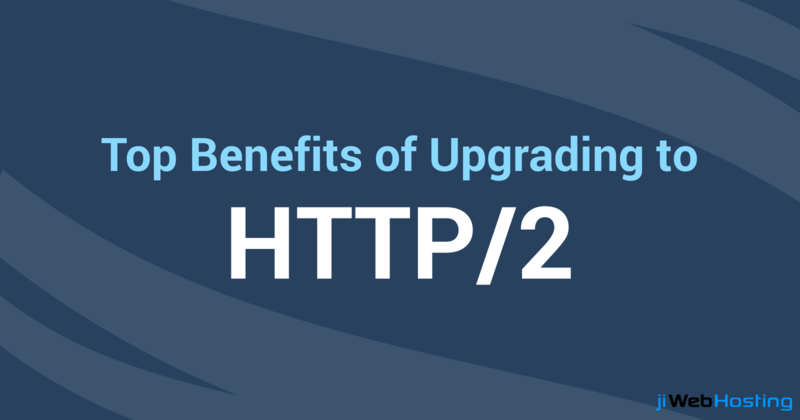 Once you are aware with the prominent features and benefits offered by HTTP/2 upgrade, you would definitely look up for a vendor which can offer you that. Isn't it? You can count on jiWebHosting. jiWebHosting offers you the most utmost hosting services at the most affordable prices and helps your website to stay updated in the industry. Still not convinced? Try our most affordable hosting plans and feel the difference yourself. Or get in touch with us at any time and get your queries cleared!